So, they now have a drive through. They have two signs letting you know. Well, the signs contradict each other in terms of both what you can do at the window and how you can pay. Then there’s this sign right before the window. They charge a $3.00 convenience fee to use the window. It’s not even a state fee; it’s specific to this branch. 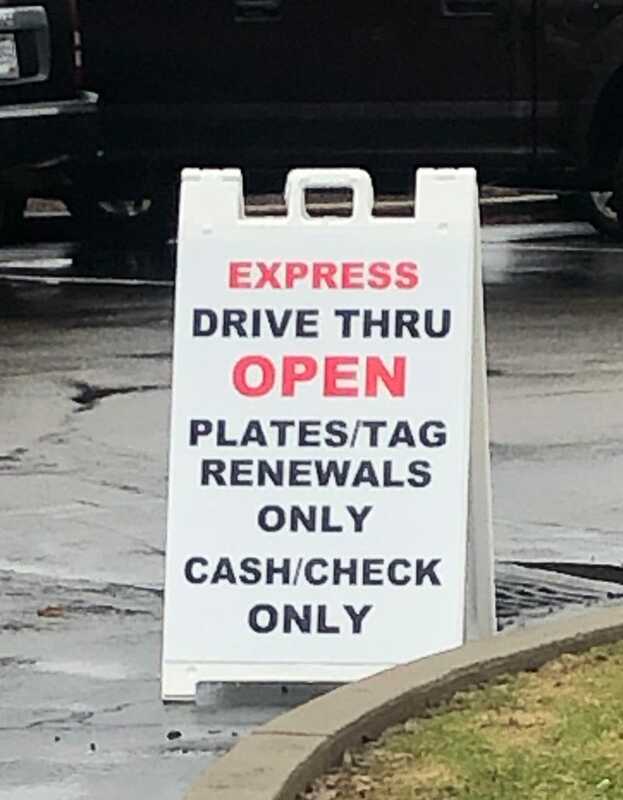 Inside they’ve added an “express” line for new tags and tag renewals. However, only one of the four employees was helping anyone in the express line so it was actually slower. One guy tried to take a number and wait for the regular counter, but when he got called they wouldn’t help him and made him get in the express line. The signs explaining the new procedures were marked on poster board and looked like a second grader had done them.